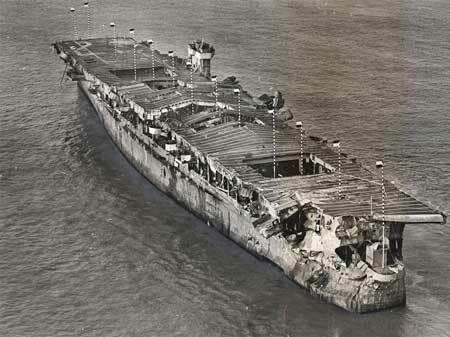 After more than 60 years — and some of the most intense action that a military vessel has ever seen — a World War II-era aircraft carrier has recently been re-discovered off the coast of San Francisco, still larded with its final cargo: hundreds of barrels of radioactive waste. The U.S.S. Independence was found in April by archaeologists using sonar-equipped submersible vehicles near the Farallon Islands, some 65 kilometers from San Francisco, California, not far from where it was intentionally sunk by the U.S. Navy 64 years ago. The vessel is said to be “amazingly intact,” with its hull and deck still visible, including what appears to be at least one airplane still in its hangar bay. “After 64 years on the seafloor, Independence sits on the bottom as if ready to launch its planes,” said James Delgado, maritime heritage director for the Office of National Marine Sanctuaries, in a press statement. Moreover, this week, nuclear scientists from the Lawrence Berkeley National Laboratory determined that the ship’s toxic cargo, while presumably still intact, is not detectable far outside the confines of the ship. At the request of Delgado’s team, the Berkeley Lab conducted tests on the submersibles used to study the shipwreck and found no traces of radioactive contamination. “They wanted to know if we could ensure the safety of their equipment and to see if you’d pick up contamination if you went down there,” said the Berkeley Lab’s Dr. Kai Vetter, in a statement. The story of how an aircraft carrier freighted with nuclear waste came to sit off the shores of a major American city begins in 1943, when the U.S.S. Independence was converted from a cruiser and commissioned to fight in the Pacific during World War II. It saw combat duty from November 1943 to August 1945 at the Gilbert Islands, the Philippines, and Okinawa, after which it was assigned a new mission: to be a target for nuclear bombs in the Marshall Island’s Bikini Atoll. There, in the summer of 1946, it was a test-piece in Operation Crossroads, a pair of low-elevation detonations designed to study the effects of nuclear weapons on warships. “This ship fought a long, hard war in the Pacific and after the war was subjected to two atomic blasts that ripped through the ship,” Delgado said. Before it was finally decommissioned in 1951, the Independence was loaded with several hundred 55-gallon barrels of radioactive waste leftover from the production of nuclear weapons, which were covered in concrete and sealed in the ship’s engine and boiler rooms. As for its levels of radiation, the Berkeley Lab points out that the submersible used to find the wreck never got within 30 meters, or about 100 feet, of the ship, so “it wasn’t a surprise” that it wasn’t contaminated. It adds that the energy from ionizing radiation, like that produced by nuclear waste, is readily absorbed by water, and that any irradiated particles, like of rust, would be “diluted” by the ocean. The lab also acknowledged that “a relatively small number of organisms close to the wreck might take up” some of those particles, but noted that most of the materials buried there are radioactive isotopes known as cesium-137 and strontium-90, which have a half-lives of 29 to 30 years. This means that in 30 years, half of the radioactive isotopes have decayed into more stable, and less dangerous forms, and that — after 64 years — less than a quarter of the original materials remain intact. There are no plans to survey the ship or its contents more closely, Delgado’s office added, and the Berkeley physicists noted that studying its radioactive cargo would likely require a new technology. “It would be exciting to build a dedicated system with some advanced technologies to figure out what is sitting down there in that old vessel,” Vetter said. It was found “not far from where it was intentionally sunk by the U.S. Navy”? I would suggest that it was found exactly where it was sunk, else we should be concerned about something awfully powerful acting on the seabed. Ships don’t generally sink straight down. They can come to rest on the seabed miles from the location they went under. The ship itself was radioactive. Probably it will be for thousands of years, unless it entirely dissolves first, which seems likely. The ship was a target in the Bikini atomic tests. It was towed back and subject of experiments to “decontaminate” it of radioactivity. It was those efforts that convinced the USN no such thing was possible. The Navy sank it with radioactive waste on board, thinking the whole ship was radioactive waste. We don’t actually know that the ship itself is less of a hazard than those barrels stowed on it. Actually we do. The absence of significant radiation shows us that. The more hazardous materials are as radiation sources, the more intensely radioactive they are, like Polonium which has a half life of about half a year. The chief biological threats from the wreck are more likely to be lead and other soluble heavy metals. Just leave teh ship there with the rest it has been there for 64 years why start messing with it it is 2600 feet down no way anyone can mess with it is to far down. and luckily so just leave it . ! I am pretty sure if they would have found radioactivity the information would have been squashed. Can’t have the people find out that our food supply is compromised by dumb actions.